Former Nike sneaker designer Karl Yamaguchi launches a new sunglass line called LOOK/SEE. Check out pictures of the glasses at STACK. You camped out for those limited editionÂ Jordan sneakers, and you're ready to rock them for the first time. 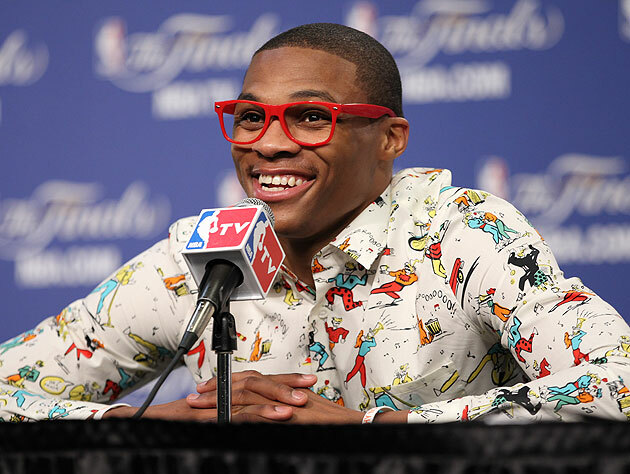 Your new shirt is crisp and your jeans are sharp, but you can't find the right pair of eyewear to pull off your best Russell Westbrook impression. Well, you're in luck. Husband and wife design team Kyle and Shu-Chu Yamaguchi have launched a new brand of sunglasses called LOOK/SEE to make sure your eyewear is just as tight as your outfit. For more than five years, Kyle was a sneaker designer for Nike Basketball, helping to create some of the hottest limited edition kicks for LeBron, Kobe and Kevin Durant. "My experience at Nike enabled me to realize that I could create something unique and special," says Kyle. "With that, LOOK/SEE was born. LOOK/SEE is a product of my professional experience coupled with my passion for bringing fun and energetic stories to life through the creation of beautiful products." You camped out for those limited edition Jordan sneakers, and you're ready to rock them for the first time. Your new shirt is crisp and your jeans are sharp, but you can't find the right pair of eyewear to pull off your best Russell Westbrook impression. Well, you're in luck. Husband and wife design team Kyle and Shu-Chu Yamaguchi have launched a new brand of sunglasses called LOOK/SEE to make sure your eyewear is just as tight as your outfit. So what's behind the name? Kyle explains: "By definition, a 'looksee' is another term for a sample in the footwear industry. A looksee sample is often very rare, limited and highly coveted. Most important, a looksee is an essential part of the product creation process." Like the launch of a new sneaker, LOOK/SEE sunglasses are released in several colorways. We were fortunate to review two of the brand's signature L/S1 model—the Medium Grey/Neon Yellow and the Black/Elephant-VRed. The first thing that caught our attention was the clever packaging. Each pair of sunglasses comes in a scaled-down sneaker box. The second thing we liked was the fun colorway combinations and patterns, which closely resemble a Nike or Air Jordan shoe design. The third feature we dug, and the most exciting, was that the rims are reflective (as seen in the video below). Finally, we are suckers for limited edition items, and most of the LOOK/SEE models are released in limited numbers. Overall, we were impressed with the product as well as its reasonable price point ($69), so we view LOOK/SEE as a must have item for sneakerheads and fashion-forward individuals. To cop a pair before it's too late, head over to the LOOK/SEE Goods website.